Happy Valentine's Day to family and friends. I've prepared my Valentine Dinner Dessert table and looking forward to Sweetheart and I celebrating our 54th year of our engagement. 54 years ago we were in San Francisco for the evening. Eating the most fabulous food and going to movies in the most beautiful theater. My candelabra sets the mood for cookies, chocolates and a glass of cider. Printable Recipe for cookie dough HERE. At Christmas my sister gave me some red raspberry jam imported from France to use as filling in the center. I also knew I had the perfect occasion for this fancy cookie. I get so much enjoyment when planning for a special occasion. Another example of planning for awhile are the purchase of these heart napkins. I found the heart napkins at WalMart last year after Valentine's Day. The're a bandana and only a $1.00 each. I was so excited to get them out and put them on the table. The napkin rings are from World Market a couple of years ago. I think the napkin rings have special character. Chocolate Dove candy...I love my chocolate. I found a set of four heart dessert plates at Tuesday Morning last year. And my fun gold flatware I found at the antique store where I had my Cozy Corner for a year. Our glasses are from my mother's estate. I love using her pretty things when I set my table. A different heart dessert plate. Their very playful design makes me smile. I'm using my tea cart with the sides up to have this little dessert table set for after we eat our lobster dinner. Every Valentine's Day for around 20 years we have prepared lobster for our special dinner. I bought tulips for this table, because I think I might be getting a bouquet of red roses on Friday and I didn't want to spoil the surprise. Sweetheart never reads my blog. Thank goodness. I love the beautiful red tulips in my vintage white pitcher. I hung some lace curtains in the windows for a softer background. Usually I see the back yard. I like this look better. I love to photograph everything. But, sometimes my heart sings when I photograph flowers. Well off to the real world. I've got to get the Valentine cards in the mail for my six granddaughters. I did find a really cute one for Sweetheart. As always I love when you come for a visit. I loved reading the stories of your Valentine traditions. My parents always celebrated New Year's Eve at home with a lobster dinner. Pretty nifty idea to shop the sales 11 months ahead of the holiday. The prices are just right. What a lovely table. I hope you enjoy your roses! Everything is beautiful! I love all the plates and the stories. The cookies are so yummy and pretty! I adore tulips and in the withe pitcher they are stunning. 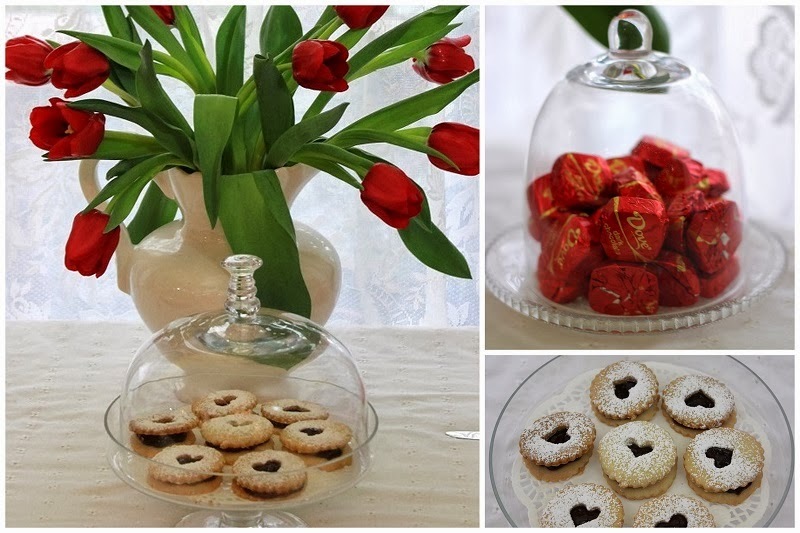 Thanks for sharing you Valentine traditions with us at TTF!